The good news is that Barack Obama said on ABC Sunday that he might not go through with his plans to increase taxes. The bad news is that the economy has to be mired in recession to avoid the largest tax increase in the nation’s history. Our check of the Dow Jones Factiva database suggests that other than viewers of ABC’s “This Week,” only three or four newspapers carried an account of Senator Obama’s amended tax plan. While it’s possible that the story of a deferred tax increase could shock the media into paralysis, we take it as an encouraging sign. The education of Barack Obama continues apace. For the record, here is what he told ABC’s George Stephanopoulos. 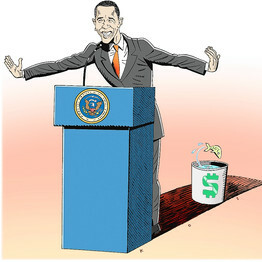 At the time, Mr. Obama was the long shot in the Democratic Presidential sweepstakes, and it made some political sense to reassure the party’s intensely liberal primary voters with class-war boilerplate on taxes. Under ObamaTax 1.0, he would have repealed all the Bush tax cuts, lifted the cap on wages subject to the payroll tax, put the top marginal rate up to 39.8% and raised the rate on capital gains and dividends to at least 25% from 15% now. The official campaign line was that tax rates really don’t matter to economic growth. Summer arrived, the Clinton challenge was history and with the general election ahead came ObamaTax 2.0. It posited that the top rate on capital gains now would be 20%, described on this page August 14 by economic advisers Jason Furman and Austan Goolsbee as “almost a third lower than the rate President Reagan set in 1986.” This was progress. Now with the big vote less than 60 days off and John McCain pounding him as a tax-raiser and pulling ahead in some polls, the Democratic nominee has decided to release ObamaTax 3.0, the most interesting upgrade so far. If the economy is still weak in January, a President Obama might defer all of the planned increases. Several interpretations of this shift are possible, none of which reflect badly on Senator Obama’s political learning curve. Beyond this lies the economic reality of jacking up income, investment and payroll taxes on “the wealthy” amid a flat or falling economy. In the standard narrative, these taxpayers exist as fat cats atop hedge funds, banks and megacorporations. Let’s toss into the vat the top-tier managers of Fannie Mae and Freddie Mac, the Beltway’s own fat-cat sinecure. The reality is that the creators of new jobs in the economy are more likely to be rising entrepreneurs or filers under Subchapter S, who typically pay taxes at individual rates. Hanging three or four tax millstones around their productive necks in January if the economy is weak will likely produce unimpressive growth and job numbers in the first year of the new Obama Presidency, and likely beyond. That in turn could drag down the Democrats in Congress who will get credit for voting these higher taxes into law. Thus Mr. Obama’s unambiguous answer Sunday to whether he’d insist on his tax increases if the economy is in an official recession: “No, no, no, no, no.” It seems Mr. McCain is right that taxes do matter. Mr. Obama’s most ardent primary supporters may not like it, but we’ll take the five “Nos” as evidence that Senator Obama may be learning the difference between liberal doctrine and sensible governance. John Edwards’ “two Americas” is little different philosophically from Karl Marx’s “two classes” (i.e., the bourgeousie and the proletariat). And Barack Obama is merely beating on the same old economic drum that the far left have been beating for years. It is the wealthy who create jobs by their leadership, their investment, and yes, their hard work (If you don’t believe me, find a homeless guy and ask him to give you a job). The simple fact of the matter is that if the wealthy lose their incentive to work and invest, the economy will tank as they withdraw from the market and shelter their assets. And we see a continuation of a deliberate attempt to distort the truth: every time Barack Obama claims that he will cut taxes for 95% of Americans he is lying: the overwhelming majority of the Americans Obama is describing already pay no federal taxes! You can’t divide by zero anymore in economics than you can in mathematics. When the Bush tax cuts took effect, it threw a lot of people (in that 60% group) off the tax roles entirely, and created a new lower tax rate (people who’d been paying 15% rate paid a 10% rate, etc). It is a flat out lie to say that the rich benefited unfairly from the Bush tax cuts. Further, the Bush tax cuts not only increased the total revenues collected by the government, and not only increased the total taxes collected from the rich, but it also increased the actual rate of taxes that the rich paid relative to lower income classes. And it did so by giving them an incentive to invest more, and produce more. Finally, corporations currently pay a 35% federal tax rate. Republican Presidential hopeful John McCain wants to reduce that to 25%. Why? Because he’s trying to make the U.S. more competitive, that’s why! The world average corporate income tax rate for industrial democracies is 24%. The 35% rate – which is the 2nd highest corporate tax rate in the world – makes the U.S. less competitive. You want to know why jobs are going overseas? There’s one of the big reasons. Some of the others are the demands of American labor unions, environmental regulations, the lack of protection from frivilous lawsuits, etc. But those issues are for another day, and will certainly not be solved by punitive tax rates that only undermine our economy and our jobs.